The Blazin’ Pianos show got its start in June of 2001 when the owner of DJ’s Dugout in Omaha decided to try the dueling pianos concept in the back party room of the DJ’s Dugout 114th Street location. The concept caught on and eventually grew to be an entertainment staple in the Omaha area. In August of 2009, the Blazin’ Pianos show made its debut at Brewsky’s Haymarket location in Lincoln where it continues to be a popular destination every weekend. After nearly 14 years at DJ’s Dugout (four different DJ’s locations over the years), the show ended where it began, at the 114th Street location due to a streamlined business model for DJ’s and that Dugout being relocated. This is when Keith Allen, having been the Entertainment Director since the show’s inception, decided to take ownership of Blazin’ Pianos and open a new venue for the show. The Blazin’ show kicked off in it’s new home on September 8th, 2016. Stop by and see our new place at 15244 W. Maple Rd. During the week, we have plenty of entertainment, including keno and live music on Wednesdays. Please view our Players Schedule to see catch your favorite acts! The piano show is rockin’ every Thursday starting at 7 PM and on Fridays and Saturdays starting at 9 PM. Please feel free to join us for drinks before the show starts. We have plenty of drink specials to quench your thirst. We are open every Wednesday and Thursday from 4 PM to 12 PM and on Fridays and Saturdays from 6 PM to 2 AM. We do not serve food, however, we have made a deal with Godfather’s Pizza next door and patrons are welcome to order from Godfathers and bring it back to Blazin’ Pianos. We also allow catering for corporate and private parties. Keith Allen began to play piano at the age of 3 and after years of playing for family and friends at home, church and school functions, he found himself with a full time job playing piano at Shakey’s Pizza Parlor in his hometown of Melbourne, Florida at the age of 16. In 1993 a new and exciting entertainment concept came to Orlando in the form of a club called Howl at the Moon Saloon. The dueling pianos concept itself was becoming increasingly popular all over the country. Dueling Pianos clubs began popping up in major cities across the land and in smaller markets as well. Keith saw this as an opportunity to help spread the concept and to get out and travel the country. So, having a couple years of dueling experience under his belt, he struck out as one of the nation’s first free lance dueling pianos players. As a free lance player he has had the opportunity to play all over the United States and work with dozens of talented performers. 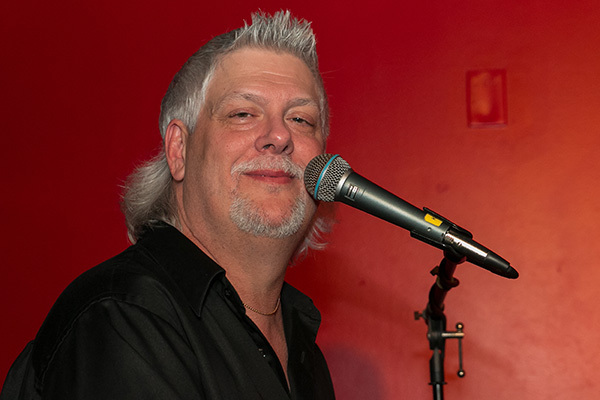 Keith Allen has been involved in the implementation and management of the Blazin' Pianos show in Nebraska since it's inception at DJ's Dugout in June of 2001. In addition to performing at corporate and private events, Mr. Allen is currently the Entertainment Director and Owner of Blazin’ Pianos in Omaha (new venue opened in 2016) and provides talent for the Blazin' Pianos show at Brewsky’s in Lincoln, Nebraska.